The team’s ambitious tour began in Guelph, a city in Southwestern Ontario, where they met with Graeme Morton, Chair of the Scottish Studies Foundation at Guelph University (who comes from Haddington in East Lothian!). He described the story of John Galt (1779-1839) born in Irvine, Ayrshire, and recognised in Scotland as a novelist, is well known in Canada for planning the city of Guelph as a town based on an agricultural settlement with generous space provided for a market. John Galt Day has been celebrated each August in Guelph since 2006 with the raising of the “John Galt Flag”, a Kirkin’ ceremony, and other community activities. Scots were also responsible for establishing the Ontario Agricultural and Veterinary colleges in Guelph. Travelling on to Ottowa, our travelling team discovered that the parliament buildings are sited on “The Hill”, the former position of the fort known as Barrack Hill. Bytown, as Ottawa was originally known, was named in honour of Lieutenant-Colonel John By, the man was responsible for the Rideau Canal. In 1832 the canal was constructed as a secure route between Montreal and the British naval base at Kingston which allowed shipping to avoid a stretch of the St Lawrence River along the New York border which was vulnerable to attack in the event of another war with the United States. It became a major trading route, especially for the lumber industry. Gillian and Yvonne were invited to enjoy an iced lemon drink with Robin Etherington, Executive Director of the Bytown Museum, whilst they heard about the humid conditions and the threat of cholera endured by the early settlers of Bytown. Robin highlighted the role of Scottish stonemasons in the construction of the canal. 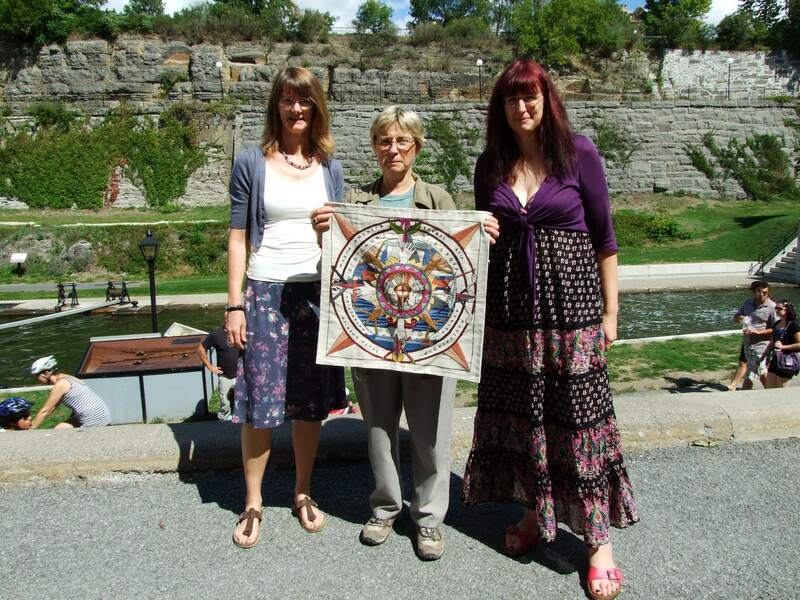 She is pictured here (centre) with Yvonne (left) and Gillian (right), in front of the Rideau Canal itself. The Commissariat erected in 1827 as a storehouse and military depot during the construction of the Rideau Canal, houses the museum and is situated a few steps away from the canal, before it reaches the Ottawa River. This stone building was designed by Thomas McKay of McKay and Redpath, Architects. McKay and Redpath were both trained stonemasons appointed by John By. McKay built his own settlement with thriving industries, known as New Edinburgh, on the eastern side of the Rideau Falls. Earnscliffe, a Victorian manor built by McKay, became the official residence of John A MacDonald, the first Prime Minister of Canada in 1867. Today it is the residence of the British High Commissioner to Canada. Bethany Basaillon, Executive Director of the Scottish Society of Ottawa and Director of the Ottawa City Piping College arrived a little later and showed great enthusiasm for the Tapestry project. Having just recently been present at Piping Live 2012 in Glasgow, she is a regular visitor to Scotland with her Sons of Scotland Pipe Band (Camp Argyll Number 26) and promised to join us in 2014 for the Scottish Diaspora Tapestry Homecoming events. The Sons of Scotland Benevolent Society was set up in Canada in 1876 to support Scottish immigrants. The Society continues today to celebrate Scottish culture and heritage. A list of stitchers and stories will no doubt follow from this important connection!